With Australia loosing one day series 4-1 to South Africa they are no more at the top of the ladder. South Africa now take the top spot and they sure deserve it. I've been out of blogging for the past couple of weeks. Its been mainly because of the work we've been putting into the Carbon based releases as well as some other stuff. In the third week of January, when Paul and Jonathan were down in Sri Lanka we were busy with planning for 2009. A group of us (A big group at that) spent three days offsite planning things out for 2009. The Semi-Final match between Rafael Nadal and Fernando Verdasco in the Australian Open was one of the best tennis matches that I have witnessed. The match lasted for over 5 hours and the intensity in the final set was a testimont to the fitness of the two players. Sadly I could not watch the whole match. For those who missed it, just have a look at this "Shot of the day" from day 12 of the Australian Open. It shows the quality of the tennis that these guys played. The celebration from Nadal at the end of the match showed how much he respected his fellow countrymen Verdasco. Clustering for high availability and scalability is one of the main requirements of any enterprise deployment. Afkham Azeez, Architect and Product Manager of WSO2 WSAS has written a couple of articles that explain how WSO2 Carbon based products (This articles apply to Apache Axis2 as well) can be clustered. In the first article titled "Introduction to WSO2 Carbon Clustering" he explains the core concepts of clustering an in the second article titled "WSO2 Carbon Cluster Configuration Language" he explains in detail as to how WSO2 Carbon based products can be clustered. As you might have already heard we at WSO2 and building a complete revolutionary SOA platform which is based on the OSGI framework. Using OSGI to build the WSO2 Carbon Framework has given our products the ability to add new functionality with ease. In this Webinar Paul Fremantle, Co-founder and CTO of WSO2, will introduce the OSGi framework. He will also talk about how OSGI fits in with SOA and how it has enabled WSO2 build the revolutionary Carbon framework. This Webinar will be held on Thursday, 20th January 2009 09:00 AM (PST), so Register now. "The pen is mightier than the sword" was a phrase that we learnt at school and it used to be that way but in the modern era that phrase should be changed to this "The gun is mightier than the pen". The truth is bitter and there aren't many who can digest it. Some group who could not stand the bitter truth that Lasantha exposed, decided to silence him. Lasantha Wickramatunga was a brave journalist who fought against injustice. He was the Editor of The Sunday Leader. Apperently he had received several death threats in his time and the sunday leader press was burnt down in 2007 by an armed gang. Lasantha was most influencial in bringing to light many currupt deals of the government. These include the alleged MIG deal and details of Mihin Air which has been a total failure. This attack comes just 2 days after a leading media station in the country was attacked and destroyed by an armed gang. This gang had used a claymore weighing 8 Kgs to destroy the MCR (Main Control Room) of this media station. The current security situation in Colombo is that there are many road blocks in the city and vehicles are searched at most locations. In the instance where the media station was attacked, it was carried out at 2.15 AM in the morning by a white van which did not have a number plate. At that time in the morning you don't get too many vehicles on the road and its surprising that this vehicle was not checked at a single checkpoint as such. Even in the case of Lasanthas shooting, it was carried out at 10.30 AM in the morning in broad day light. The government who condemns the attack says that they will conduct a broad investigation into this matter. Can the people believe the government? Not really. Not when ministers in this country can brake into media stations and assault its officials. This alleged minister is still free and is still a minister. One could say that the people are to be blamed for electing such ministers. But thats not the case, this alleged minister did not go into parliament by votes cast by voters. Apparently he got the least number of votes in Colombo (something around 2200 votes and Colombo has over 1 million voters) and was rejected by the people. But made it into parliament from the national list. The president who is the leader of this political party should take the full responsibility of this appointment. In a society where people have diverse ideas, its a fact that not all will agree with what a person has to say. That does not give the right to anybody to silence another person. I'm a great fan of cricket but I'm not a great fan of the Aussies. I do like the way they play attacking cricket but I do not like there approach to the game. Cricket is supposed to be a gentleman's game and I'm sure that sledging is not a part of it. I hate the way the Australians try to intimidate the oppositions by sledging. Why not show your authority with the bat and ball rather than using dirty tricks. Having said that I very much appreciate the way the Australians make sporting decelerations. This (The current match been played against South Africa) is not the first time they have done it either. Both Steve Waugh and Mark Taylor used to do it as well. sporting decelerations makes the match much more interesting and Mahela please take note of that. Sri Lankas declaration today against Bangladesh (setting them a target of 624) was a mere joke. Its true that today was just the fourth day of the test but why do you need to set Bangladesh such a big target? This is something that Mahela should learn from Ponting. This is not just a problem with Mahela, we see this same problem with other asian cricketing nations too. Asian nations (cricketing) do not want to give anything away, they do not want to take the risk of loosing the odd match in favour of winning a bunch. That is the very reason as to why sub-continent matches end up been drawn more often. You could follow the "Invoking Web Services from a Mashup" tutorial to get a feel of how easy it is to access web services using the WSO2 Mashup Server. An example showing how each of these mechanisms could be used to invoke a web service in a synchronous as well as asynchronous manner. It also gives an example as to how a secure service could be accessed. Whether or not an ESB should host services is a debatable topic and there is no right answer to it. Some do like to host services on their ESB while the others like to have their service deployment separated from service mediation. I personally like the idea of having my services separated from the mediations. The WSO2 ESB (Enterprise Service Bus) did not allow deploying services on it right up to the 1.7 release. But we did have a few customers who wanted that feature. Now with the revolutionary WSO2 Carbon framework (Which all future generations of WSO2 products will be built on) users can have their ESB just the way they want. The traditionalist who prefer to have there services separate from mediations could use WSO2 WSAS and the WSO2 ESB. For those who want service deployment on their ESB, its just a matter of grabbing the service deployment components and dropping it into your ESB. Charitha has written a nice little blog post that explains how this could be done. In his last post for the year 2008 Azeez had posted a picture of the Carbon team (Mind you the picture shows just a part of the Carbon team, there are more people who contributed to its success). The picture wouldn't be complete without the leader of the Carbon team himself. 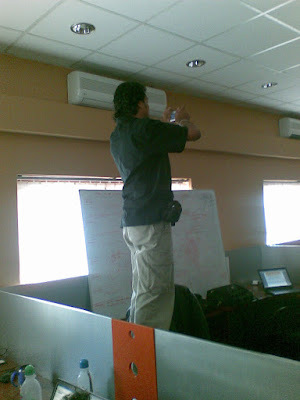 So here are a couple of pictures that were taken when Azeez was taking photographs of the Carbon team. Figure : The White board on the background is what we used to track daily progress. I've been using StatCounter to track visits to my Blog since June 2008. 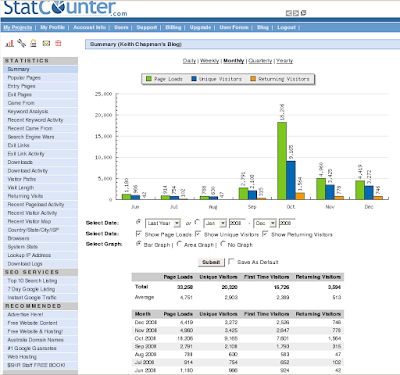 I came to know about StatCounter from Charitha who was using it to track visits to his blog. The following image shows the visits to this blog for the year 2008. The graph looks like the city of Colombo with one huge sky scraper. 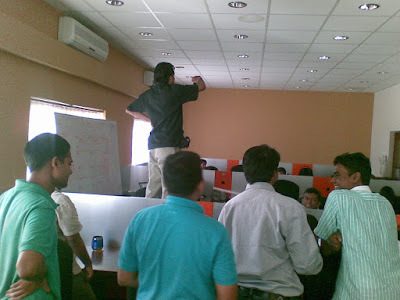 That was the month that I started blogging extensively about Axis2. Its nice to see that these posts did help quite a few readers in sorting out there issues. I plan to blog more extensively in 2009, so stay tuned. And a big thank you to the readers of this blog. 2008 was a busy and successful year. It was also a year that I traveled a lot. I traveled to the US 6 times and spent about 2 months out of the country. After a 2 week visit to the US I spent 2 weeks at home before heading out to the US again. This time it was to conduct a few training at SDWEST 2008 which was held in the Santa Clara convention center in California. This time I had one week at home before heading out to the US again. This time it was to attend the Microsoft Web Services Interop Plug-fest held at the Microsoft campus in Redmond, WA. On our way to Redmond we were gonna spend a day in the Mountain View office as well. The good thing that time around was that I was not traveling alone. Actually this is the only time that I have traveled to the US with my colleagues. It was an unforgettable trip too with us missing our connecting flight from Los Angeles to San Francisco, this was after spending about 40 hours from Colombo to Los Angeles. We spent the night in Los Angeles and headed out to San Francisco the following morning. We then headed off to Seattle later that evening. Been there along with quite a few friends meant that we had a good time. My next visit to the US was in May and it was back to New York city. It was a consulting engagement and it was for a large stock broker in Wall Street. They were gonna use WSO2 WSAS and WSO2 ESB as a solution to there requirement. We were able to get then started off within just 5 days of work there. Now they are using this solution in production and is one of our good customers. In between all these travel arrangements I was working on the next release of the WSO2 Mashup Server as well. We were able to release the 1.5 version of the Mashup Server in July. This was a major accomplishment for us. My next visit to the US was in August to conduct a four day training course on Apache Axis2. This time around I was in the scorching heat of Phoenix, Arizona. It was just about this time that we were seriously starting work on WSO2 Carbon and the rest of the year was spent on making WSO2 Carbon a success. But my traveling for the year wasn't over, my last visit to the US last year was to attend ApacheCon US 2008 which was held in New Orleans. This was by far the best trip I've had to the US. To finish off a fantastic year we had a few beta releases of WSO2 Carbon based products. This year will be spent solidifying the products built on the WSO2 Carbon platform. I will be also looking forward to releasing the 2.0 version of the Mashup Server which will be based on WSO2 Carbon. I uploaded photos that I took in New Orleans last November. I was there for ApacheCon 2008 and it was freaking awesome. To start things off I was on a A380 for the first time. ApacheCon 2008 was held in the Sheraton Hotel in New Orleans which is located beside the Mississippi river. I had a great view of the Mississippi river cause I was on the 47th floor. The view from there was simply amazing. ApacheCon itself was a great event with several good talks and keynotes. A highlight of the event was the "Funeral march for proprietary software". This was a really fun event where we marched along the streets of New Orleans with the world famous Rebirth Brass Band and ended up in the "Howling Wolf Music Hall". I did upload quite a few photos of this event too :). New Orleans was a fun place to be in and it sure was a city that never sleeps. It was late nights on a daily basis with us walking from one club to another. Baring a couple of days where I went to bed early the earliest I slept was 3.00 AM which there were a couple of days that I slept at 6.00 AM as well. It was all about getting to know each other in the Apache community and having fun together. It was the best trip I had to the US. I also took the opportunity the walk around New Orleans. I did visit the famous French Quarter area as well as Cafe Du Monde which is famous for there French Donuts. And yes I didn't forget to get a pack of Cafe Du Monde Bignet Mix. I also visited the Aquarium down there and it was an amazing experience. It was the first time I had visited an aquarium of this magnitude and I made sure that I got plenty of pictures so that I could share the experience with my family. What a start to 2009 its for Sri Lanka as a country. Within an hour before the dawn of the new year troops captured Paranthan and a few minutes ago the Sri Lankan government made an official news release stating the fall of Kilinochchi. I would like to thank all those who shed there blood and laid down their lives during this endeavor. Well it was like the dawn of another year with fire crackers firing all over the place. That shows how much the public embraces this important moment. Now to the other side of the story, in Sri Lanka everything has a political influence. And I'm sure the government will use this to there utmost advantage. Even during the speech made by the President he asked all people of this country to make a sacrifice so that this war could be finished soon. Well thats a fair enough statement but why cant the government make a sacrifice too?. The government is maintaining over 100 ministries (Mind you Sri Lanka is a small country with just over 20 million people) and no moves have been made to cut down the waste made by these ministers. They keep spending our tax money and enjoy a luxurious life and expect the poor tax payers of this country to make sacrifices. Well a good example is the fuel crisis in Sri Lanka. A few weeks ago the supreme court ordered that petrol be sold at Rs. 100 a liter and that the tax charged on petrol should not exceed a 100%. At the time of this verdict petrol was Rs. 122 a liter. The response of the government to this situation was turning a blind eye on the verdict of the supreme court. On the eve of the new year the government announced that they would reduce petrol by Rs. 2 and that it cannot reduce it further due to the high expense incurred on the war. Well true enough, the expenditure on defense matters is high and we can see the benefits of it, but has any measures been taken to cut down on the unnecessary expenditures made by the government? Is it just the poor tax payers of this country that should make all the sacrifices? Motor vehicles in Sri Lanka carry a tax of around 300%-400%, and all ministers are given tax permits to bring down luxury vehicles. These luxury vehicles are very high in fuel consumption and even the fuel is provided by the government (or by tax payers money). Now Mr President, why not cut down on those cost? Why not get your ministers to make sacrifices? Yes its too good to be true. The Sri Lankan armed forces have entered Kilinochchi and is in the process of taking control of the LTTE stronghold. Kilinochchi was the main place the LTTE operated out of and the Sri Lankan forces expect the fall of Kilinochchi within the next couple of hours. In this podcast I talk about how WSDL 2.0 can be used to describe RESTfull services. I also talk about why one would want to describe a RESTfull service using WSDL 2.0. In this podcast I mention about a couple of examples up on mooshup.com which shows how a RESTfull service can be described using WSDL 2.0. You could find more details about that example here. In this podcast which was published a couple of weeks ago I talk about what WSDL 2.0 is all about and why people would want to use it. If you are a newbie to web services and want to learn about WSDL then I would recommend you to have a look at WSDL 2.0, simply because its much cleaner and easier to understand. In this podcast I also mention about the interop we had for WSDL 2.0. The results can be seen here.